When it comes to slots, the general rule of thumb is that bigger is better. Simply look at our reviews of the Dark Knight to Immortal Romance, and you'll see huge jackpots and lavish bonus modes are normally the order of the day. But with Nuclear 9s, Microgaming’s latest slots title, things are somewhat different. On the surface, Nuclear 9s is a pretty straight forward slot: five reels, nine paylines, and a familiar blend of standard symbols, wilds and scatter bonuses. Visually, it’s a pretty pleasing game, offering sharp images, flashy animations and the clichéd eerie green glow associated with nuclear activities. But ultimately, there seems to be little to suggest it’s anything out of the ordinary. But don’t be fooled, because Nuclear 9s comes with a surprise up its sleeve. 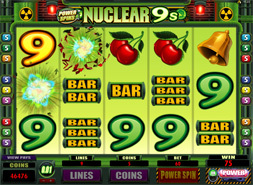 Rather than having a traditional bonus mode, triggered when a set number of a certain symbol type appears on screen, Nuclear 9s is the latest slot to use Microgaming’s Power Spins system. When the option is enabled, all matching symbols self-destruct, forcing those above them to drop down into their places. Should this generate any further matches, then your winnings for those matches will be doubled. The process is repeated until there are no more matches. This game-changing feature does come at a price however, with the number of coins wagered increasing when the mode is enabled (60 coins for a maximum bet, as opposed to 45 without). Likewise, the lack of a traditional bonus mode means the insane jackpots found on other slots aren’t present in Nuclear 9s: the maximum jackpot is 50,000 coins. But although wins are typically smaller, the fact Nuclear 9s has fewer symbols than more elaborate slots ensures they do come around more frequently – which in turn makes the Power Spins system more appealing. And while this is likely to divide opinions among slots fans, it’s still worth checking out. Play Nuclear 9s at All-Slots Casino now!